Dr. Forrest Shreve and his staff at the Desert Laboratory near Tucson are prying into the secrets of desert plant life. HERE, THOUGHT I, is where I can unloose all those stored-up questions about desert life. Here before me is the man who knows all the answers. Questions came flying to my lips. “Why doesn’t the giant sahuaro grow west of the Colorado river?” I heard myself asking. I had heard this matter of the sahuaros much debated and had always believed that the giant cactus grew only on Arizona soil until I had stalked a few lonely specimens north of Picacho and others along the Riverside Mountains on the California side of the river. But as a general rule this picturesque cactus, bearing Arizona’s state flower, marches down to the edge of the Colorado River and there abruptly halts. This was too much. I had come to Tucson to talk with a scientist, scholar, musty pedagog, and here I found a tall, friendly out-of-doors man with a sense of humor. I began to be very glad I had come to see Dr. Forrest Shreve in the Desert Laboratory on the slope of Tumamoc hill. his place before the orderly table, lighting his ancient pipe leisurely, suggesting comfortably that we should have lunch with his wife and the staff before we got down to the serious business of discussing his work at the laboratory. Arizona sunlight poured through the many windows, falling on orderly rows of bookcases, charts, graphs, photographs, and scientific instruments. Nowhere was there evidence of the cobwebby mustiness which, in the layman’s mind, is an essential element of the pedagog’s workshop. I turned toward the spacious windows to look down on the roofs and spires of Tucson and the brown bulk of the Santa Catalina Mountains beyond. What a beautiful site for the Desert laboratory! There before me, less than two miles away, lay the cultural capital of the Southwest and stretching in all directions from its borders lay the beautiful arboreal desert now famous throughout the world. And this brown stone building—the Desert Laboratory of the Carnegie Institution of Washington—had housed the men who had done most, in a quiet unheralded way, to make these deserts famous. This much every desert dweller has heard. But the idea of a desert laboratory is remote and hazy to most of us. If we give it a second thought, we probably regard the place as a sort of cactus garden where super-gardeners tend their neatly-spaced plots of spiny plants. But as I came up the steep grade to the buildings on the hill I saw no well-tended gardens. In fact the terrain looked just a little wilder than the desert around it, a sort of refuge where cottontails, quail, and lizards frolicked in unmolested freedom and the native plant life seemed more abundant. And this man before me—the director of this famous laboratory—certainly did not look like a gardener. We had lunch—the laboratory staff, the little lady with the gray hair and voice of a girl, and the reporter. As Dr. Shreve described with the language of a scientist the pecularities of a certain desert plant, I wondered whether the little woman was following him. I had become lost about two courses back. I thought she must be a very brave wife to have lived with this man so long and to have suffered these undecipherable descriptions so well. My doubt changed to admiration when I learned that Mrs. Shreve is a distinguished scientist in her own right and that she is the author of one of the most widely quoted papers listed by the institution! “What is the Desert Laboratory? Who started it and why? Why was it placed out here so far from the so called centers of culture? What do they do here? Who works here?” These and other elementary questions I fired at Dr. Shreve. The late Dr. F. V. Coville, chief botanist of the U. S. Department of Agriculture for more than 40 years, brought to the attention of the Institution the need for investigation in the field of plant life. He and Dr. D. T. MacDougal, then assistant director of the New York Botanical garden, were appointed to make an investigation of sites for a study of vegetation in arid lands. In 1903 they recommended Tucson because of the richly diversified character of desert vegetation in the vicinity and because of its accessibility to other desert areas. 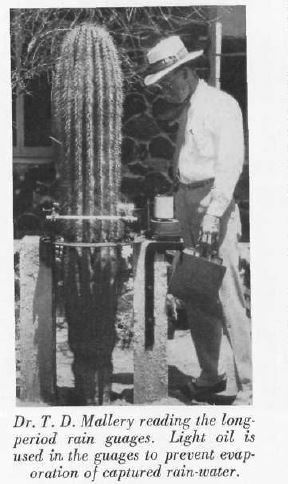 Dr. MacDougal was named director of the Desert Laboratory but during the three years required for him to finish his work at New York, Dr. W. A. Cannon was made resident investigator at Tucson. Other scientists who have made valuable contributions to the world’s knowledge have spent some time at the laboratory, but Dr. MacDougal was for twenty years the driving force, inspiring projects of scholarly brilliance. Retired from the laboratory ten years ago, Dr. MacDougal is now a resident of Carmel, California, where he is continuing his work with the Division of Plant Biology. Short of stature, solidly built, Dr. MacDougal has the brusque forcefulness of his Scotch ancestors. Yet he inspired unflinching loyalty and respect from the men who worked with him on the desert. There is earnest-eyed young Dr. T.D. Mallery, who at 36 has the highest scholastic degree as a result of his studies on the osmotic movement of sap in Larrea (creosote bush). The factors he has formulated have a bearing on all desert plant life. With a physical build along the lines of a varsity halfback, this youthful scholar is human and practical in his attitude toward life in general and his work in particular. Twice a year “Tee Dee” takes a trek of several hundred miles over the desert to inspect his “string” of rain gauges. These gauges, located in isolated places, hold the secret of important data on rainfall and climate. Then there is another young fellow, W. V. “Bill” Turnage, who has no vernacular like a veteran. And a veteran he really is, because he has been studying at the laboratory for seven years. Starting as a laborer on a concrete gang nearby, this young fellow who looks like a college sophomore read his own paper on desert climate to a distinguished session of the American Association for the Advancement of Science at Denver this summer. And just to fill in time while he worked “on the hill” these past seven years, Turnage completed his university course and crammed in a few graduate courses. He can squint at a cloud, tell you how high it is, where it came from, whether it will bring rain and any other data you may request. I concluded he would be a good man to have around on a summercamping trip in Arizona. There have been as many as four or five men—and occasionally a woman scientist—working at the laboratory at one time. But for several years Dr. Shreve “held the fort” alone. Special line investigators, men whose work is supported by a scientific foundation or great university, sometimes spend from a few days to a few years at the laboratory. They each work independent of the other, yet each is aware of the other’s course. Of the thousands of winter visitors who come to Tucson annually there may be a dozen or so who will inquireabout the way to the Desert Laboratory. Chances are they will have to ask a half dozen Tucsonians before they secure correct directions for the two mile drive. Obviously, casual visitors on Tumamoc hill are not encouraged. The scientists prefer comparative isolation in order to preserve the fine balance of plant and animal life within the 800-acre tract. It may be pertinent at this point to inquire why the layman, the average American citizen, should be interested in the work of the Desert Laboratory. Dr. Shreve admits frankly he does not believe his work of any interest to the layman. “But to the super-layman and interested student,” he added, “we have a unique institution, designed and intended for investigation of desert plants and conditions which surround them. There may be no immediate practical utility in the work we are doing but we are laying the groundwork for a new science, a mass of knowledge concerning a large portion of the earth’s surface about which we have hitherto known very little. 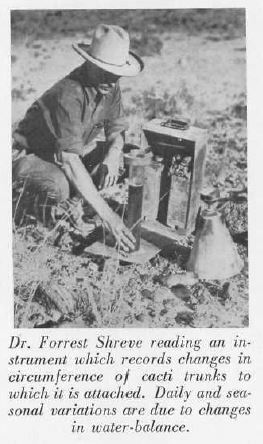 Yet, while Dr. Shreve minimized the contribution of the laboratory’s work to the improvement of the desert dweller’s way of living, a perusal of the titles of the many papers prepared by the staff is evidence enough that there is great practical value there. For instance, Dr. Shreve wrote for the Headwaters Engineering Conference at Washington last year a paper describing the conditions and patient labor necessary to improve grazing on desert lands. His knowledge of the keen balance of life, of soil moisture, rainfall and runoff, climate and wind movement all contribute to a basic understanding of soil erosion. Indirectly, many of the other studies pursued at the laboratory will eventually aid agriculture and stock raising and improve living conditions on the desert. More than 360 papers (a scientist’s term comparable to the newsman’s “story” and the magazine man’s “article”) have been produced by staff men at the laboratory. These articles describing work at the laboratory appear in magazines, scientific journals, school textbooks, Carnegie Institution news releases and books, and government publications. They are not always purely technical but they are usually “slanted” well above college essays. For instance, one of the first works published by the Institution was a large volume by MacDougal and Coville called “Botanical Features of North American Deserts” which embraces 115 printed pages in describing areas of the southwestern deserts. The findings recorded in this book emphasized the timely and strategic location of the Desert Laboratory at Tucson. Another monumental scientific work by MacDougal and associates was a book published in 1914 describing the Salton Sea Basin. And Shreve published a large volume describing the vegetation of a mountain range as conditioned by climatic factors. These and similar studies are the result of patient physical labor and ardous mental toil. One of the productions in which Dr. Shreve displays much pride is the four volume work by Britton and Rose on “The Cactaceae” which gives “descriptions and illustrations of plants of the cactus family.” This monumental contribution has become the cornerstone for a nation-wide cactus and succulent hobby and the foundation for all works on the classification of cacti. Many of the papers deal with water relations in desert plants, the rate of intake and loss of moisture and the mechanism of control which makes it possible for plants of arid lands to withstand years of drought. The scientists of the Desert Laboratory are not stay-at-home bookworms. Much of their time is spent in the field, traveling several thousand miles a year in studying desert vegetation from the great basin of Nevada and Utah to the high plains of the Mojave region, into the rocky fastnesses of the Chihuahuan desert, and into the arid regions of northwestern Mexico and Baja California. 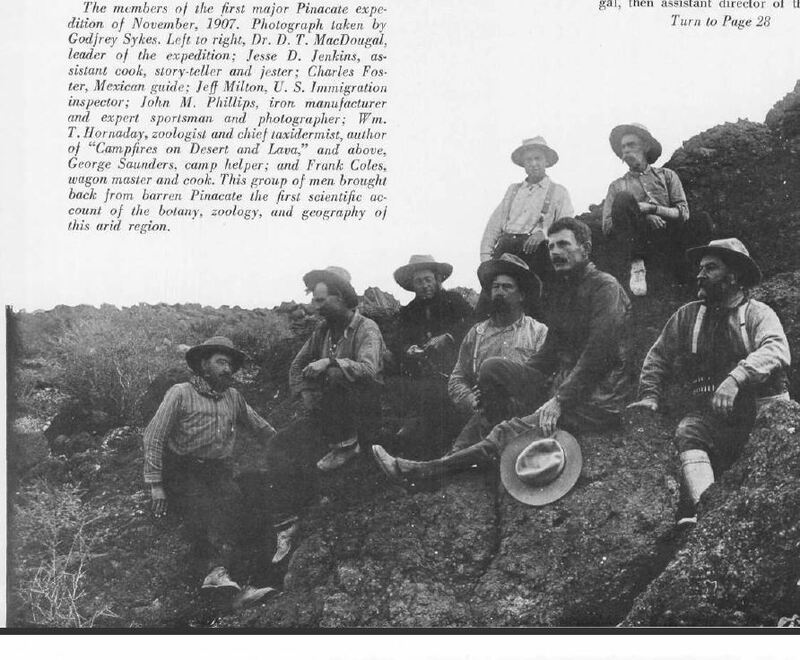 One of the first great expeditions of the laboratory staff was taken into the Pinacate region of northern Sonora in 1907. Dr. MacDougal was leader of the party of nine men, which included Godfrey Sykes and Dr. W. T. Hornaday. 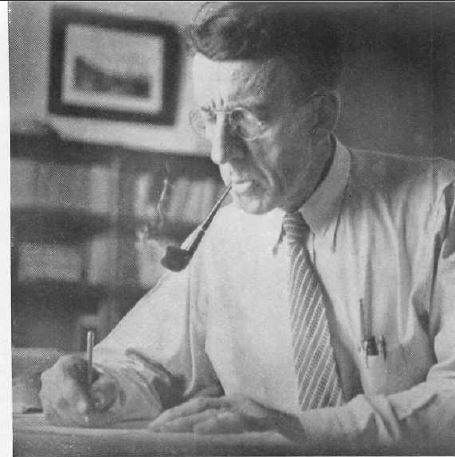 Sykes remained with the laboratory for many years and although he formally retired from active service in 1929, he is still actively pursuing hydrologic investigations along the Colorado and other southwestern streams. Dr. Hornaday died last March after a life dedicated to wild life conservation. He was the author of a penetrating and human book, “Campfires on Desert and Lava,” which is an account of the expedition into the Pinacate region. This still partly unexplored area, named for a small beetle of the desert, embraces about 700 square miles of lava flow and more than a hundred craters of extinct volcanoes. Several craters, which now bear the names of members of the party, are more than a mile in diameter and have steeply precipitous sides. From this weird and fascinating desolation the party of explorers brought a story both novel and startling, one of the treasures of southwestern desert lore. Since this memorable expedition, scientific parties have gone into the region a number of times, the most recent led by Dr. Shreve in the spring of 1936. Perhaps one of the reasons why the area remained unexplored for so long—and is incidentally an index of its aridity—lies in the fact that in an area of seven thousand square miles in which Pinacate peak is the center, there is a total population of less than fifty persons! The Desert Laboratory is only thirty-five years old, a new-born babe in the eternity of desert time. And the men who labor there, seeming to realize the immensity of the work yet undone have chosen a life of research and study both intense and far-reaching. Here the desert is truly under a microscope and its closely guarded secrets are being brought to public view. Not now, perhaps, but soon, desert dwellers will give fervent thanks for the foresight of an immigrant boy and for the tenacity and intelligence of these desert men of science.